Ist das nicht unglaublich? Wir haben Mitte April und man kann draußen Tee trinken. Heute war es warm genug dafür. 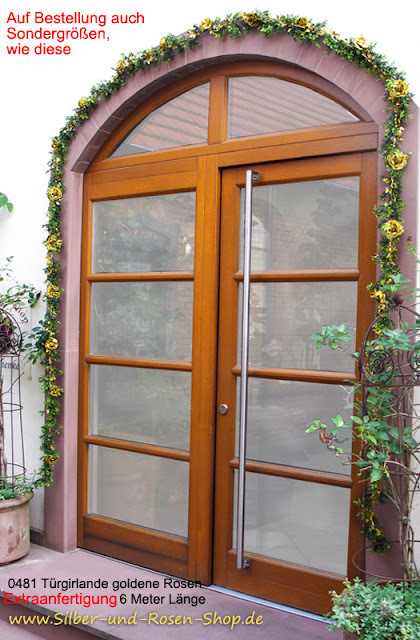 Ich habe für dich und mich im Garten gedeckt. Und wie ich im letzten Post angekündigt habe, gibt es heute Veilchen zum Tee. Its unbelievable. April started and the weather is warm enough to have a tea time outside. I have set the table for you and me in the garden. 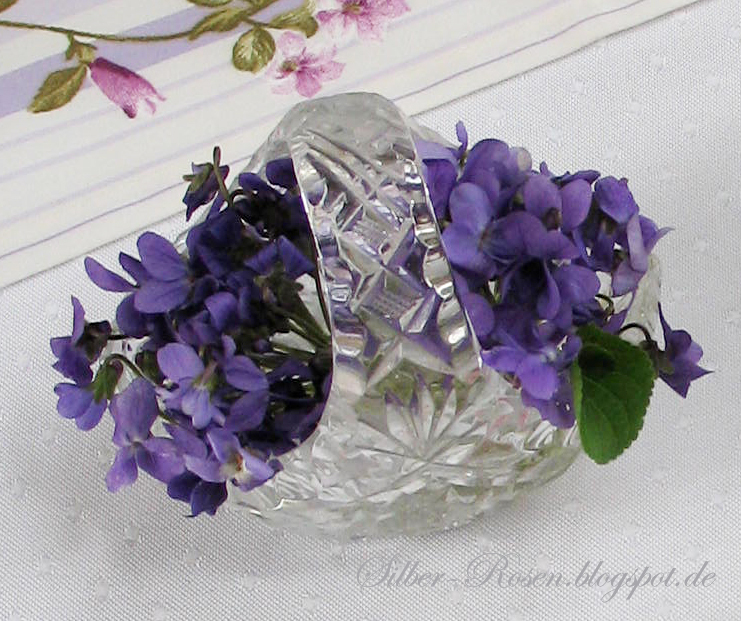 And as I announced in my last post, we will have Violets for tea. 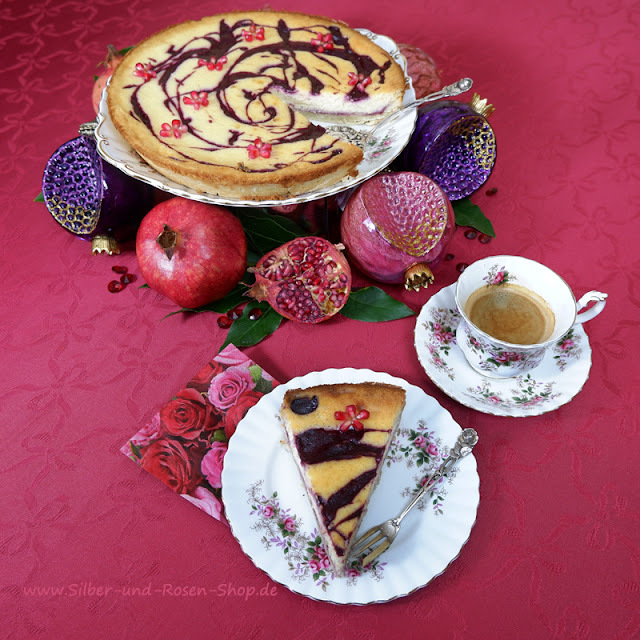 Violett und Rosa passen schön zusammen. Stuhlkissen und Tischdecke schmücken sich zwar mit Stiefmütterchen, auf den Servietten sind aber Veilchen. Und die Garnitur auf den Kuchenstückchen besteht aus Minzeblättern und kandierten Veilchen. Violet and pink match perfect. 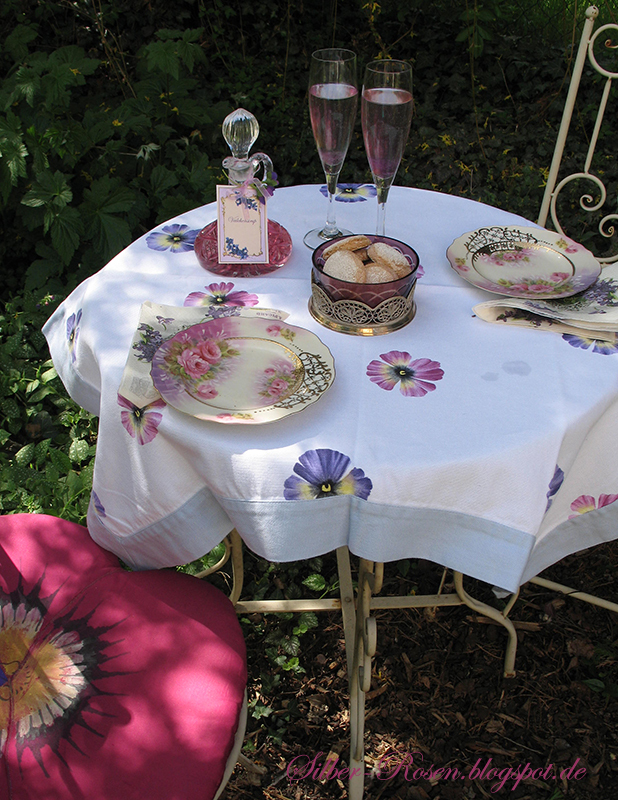 The chair's cushions and tablecloth are adorned with pansies, but the napkins are with violets. 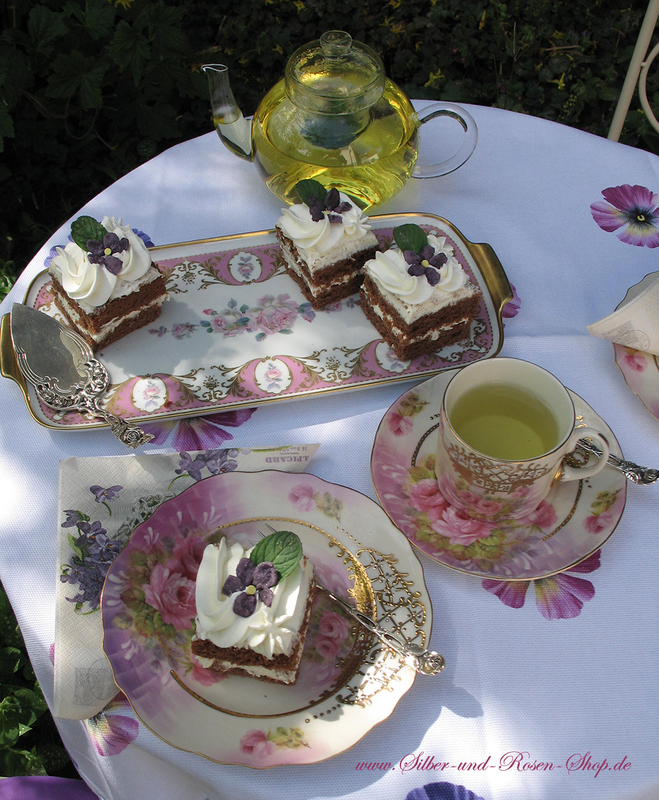 And the cake are also topped with true Mint leaves and candied violets. Die Veilchen habe ich selbst kandiert. I candied the violets by myself. Die schöne Kuchenplatte stammt aus den 70er Jahren von der Firma Kaiser. Sie passt im Farbton perfekt zu dem Rosengeschirr. The sweet cake plate is made from Kaiser in the 70th. The colors match perfect with my rose china. Zu diesen Kuchenstückchen trinken wir Tee aus frischer Pfefferminze. Die Farbe ist ganz natürlich. We will have peppermint tea from fresh leaves. The color is all naturally. Nach dem Tee zeige ich dir, was ich noch aus den Veilchen gemacht habe. Zum Beispiel diesen Veilchensirup. 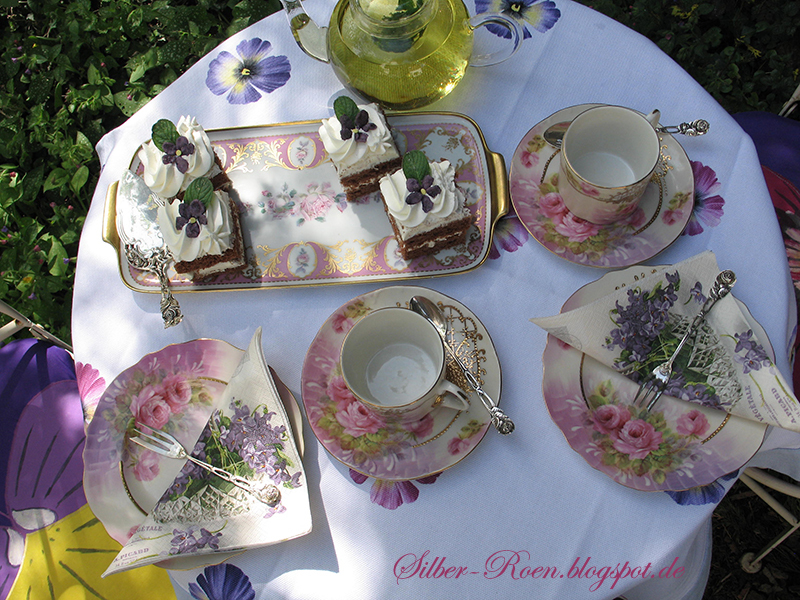 After we had tea, I show you, what I've made ​​from the violets. For example, this violet syrup. Den Veilchensirup kann man in Mineralwasser oder in Sekt trinken. 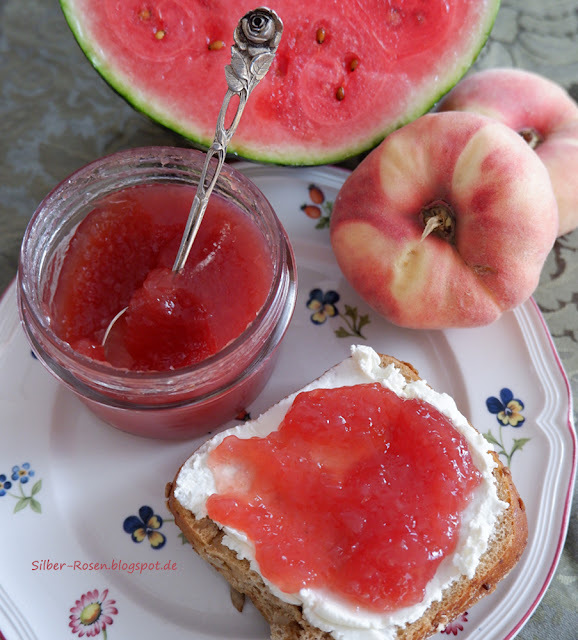 Die Rezepte für die kandierten Veilchen und den Sirup findest du am Ende des Posts. 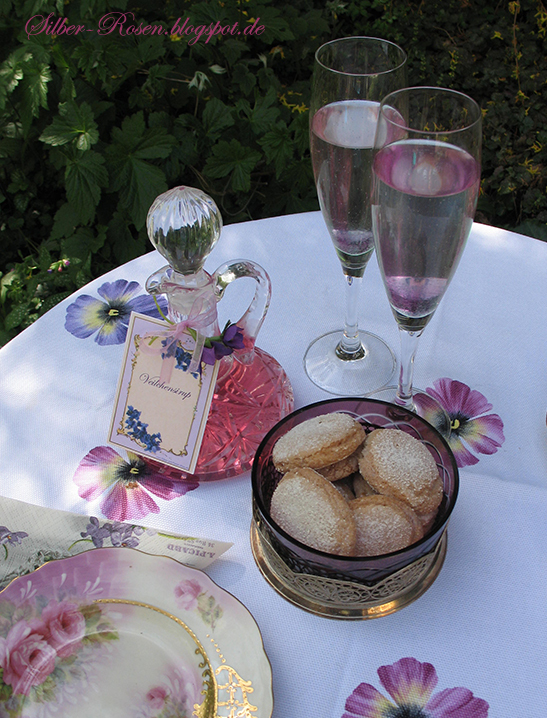 The violet syrup is nice with mineral water or champagne. I will link the recipes on the end of this post. Die Verfasserin hat allerdings noch Speisefarbe dazugegeben, während meine naturfarben sind. And to the diluted syrup we eat violet macaroons. The recipe for this specialty, I have found here: http://www.franzoesischkochen.de/biscuits-violets-de-reims-a-la-violette-de-toulouse-biscuits-roses-de-reims-mit-veilchen-aus-toulouse/. The author, however, has added food color, while mine are natural color. 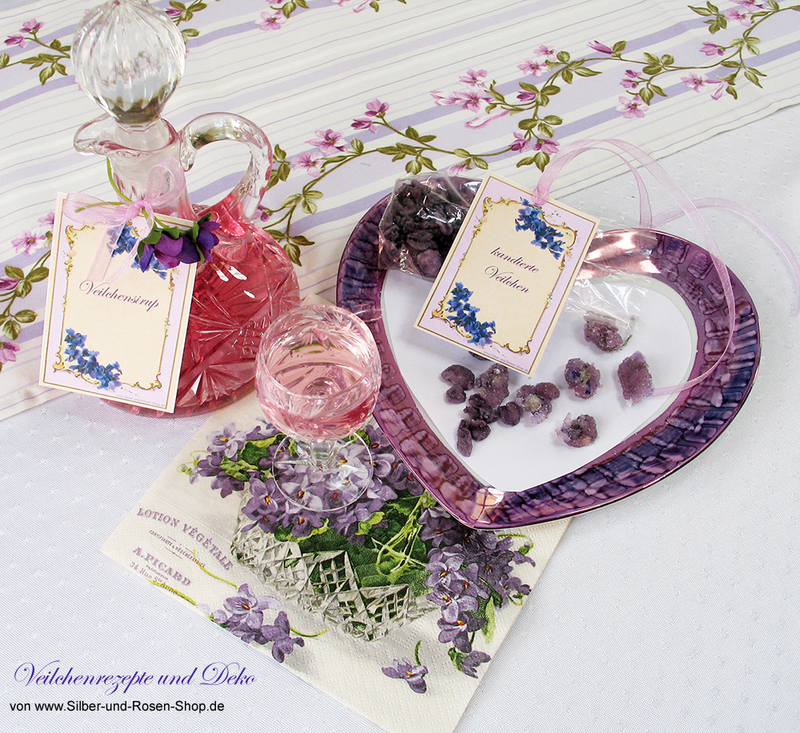 http://www.silber-und-rosen-shop.de/Deko-nach-Jahreszeiten/Veilchen-und-Rosen-kandieren. Dort gibts auch die Etiketten zum Ausdrucken. 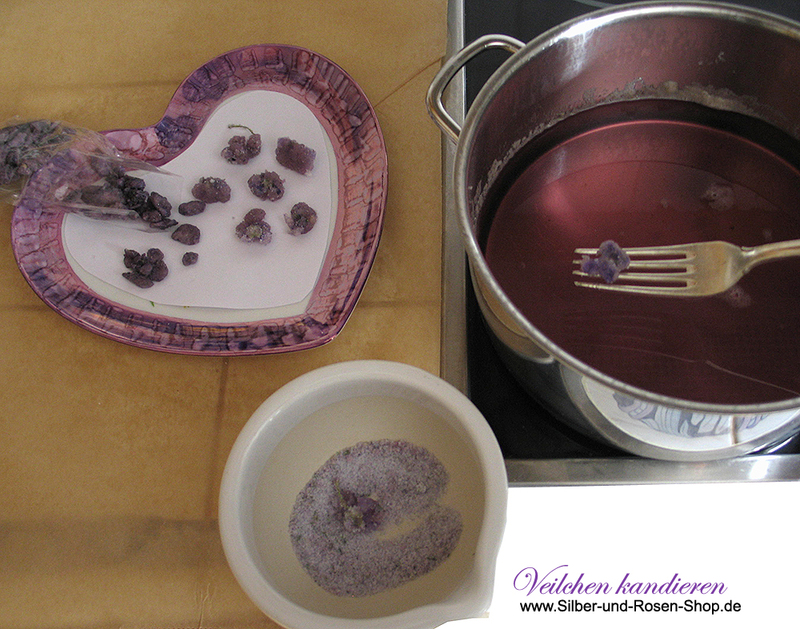 http://www.silber-und-rosen-shop.de/Deko-nach-Jahreszeiten/Veilchen-und-Rosen-kandieren. Sorry, they are only in German. I hope you can use a translator. There also the labels there to be printed. Danke für deinen Besuch. Ich wünsche dir eine schöne Frühlingszeit. Thank you for your visit. I wish you a wonderful spring time. Delightful! Violets are so sweet. I wish I could grow them here. I've tried, but no luck. This is a beautiful tea time, Johanna. The little cakes are calling my name. Your china and silver ware is as usual exceptional and so are your recipes and tips. What a beautiful tea post, my friend! Your candied violets look so pretty on your cake and I love the colour of the syrup. I LOVE your rose china! 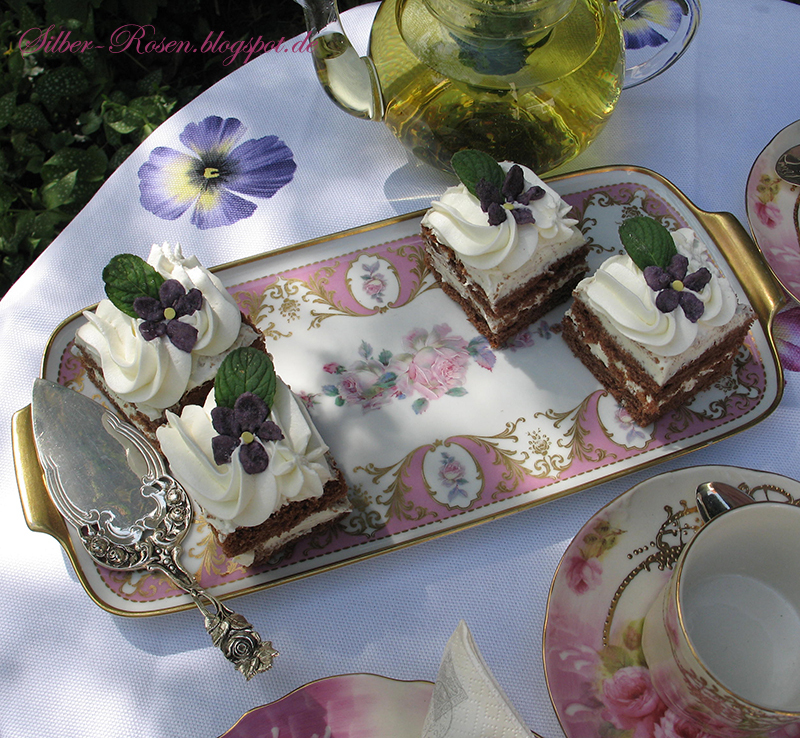 A lovely setting today and thank you for linking it with Tea Time. Have a lovely week. The table cloth is so lovely, and the cushions too. You are using one of my favorite china today too! You might remember I have a tea cup set just like your china here. It looks amazing all together with the purple of the violets. How delightful to have tea outside. Your teascape is lovely. 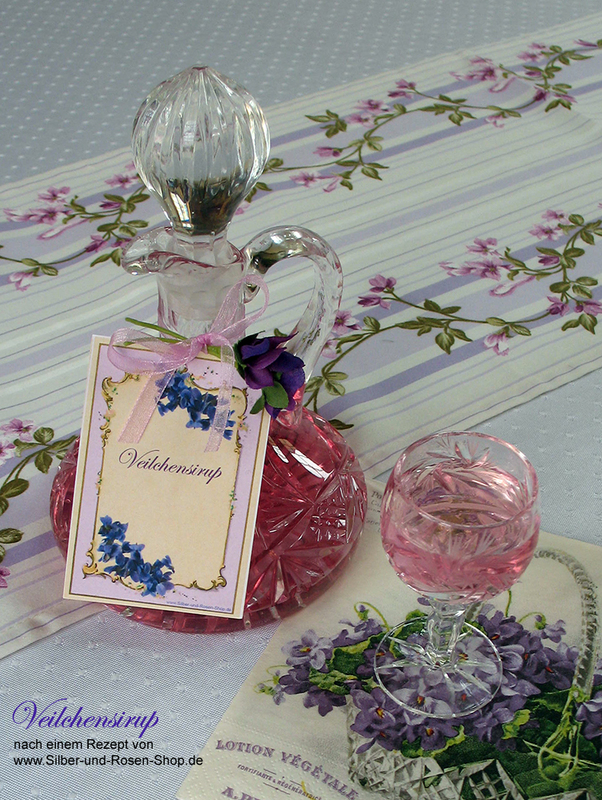 Very creative with all your violets -- sugared and syrup .. sounds like a taste of springtime! Happy Tea Day! Was für ein liebevoller Beitrag. Das Geschirr ist sehr schön. Veilchen selbst kandiert, wow - da hast du viel Arbeit gehabt. Ich war übrigens in Stoke-on-Trent, mehr verrat ich hier nicht. Violets, pansies and roses - how beautiful Johanna! 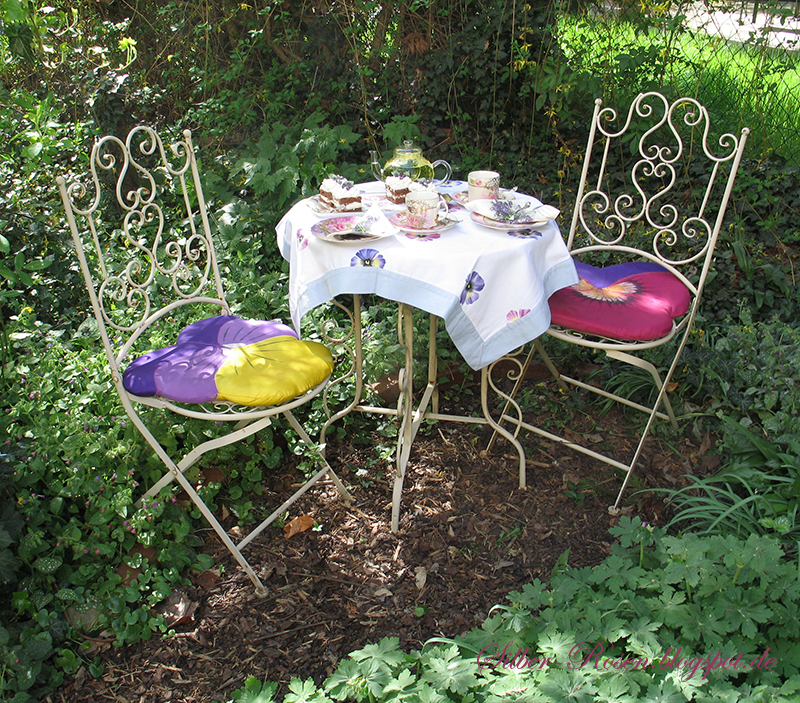 Your first tea in the garden too - how wonderful! We finally have some warm weather melting the snow away here. Thank you Johanna for all your creative displays. Wieder so schön arrangiert, liebe Johanna !